A good curry is a lovely thing, warming, filling and totally satisfying. 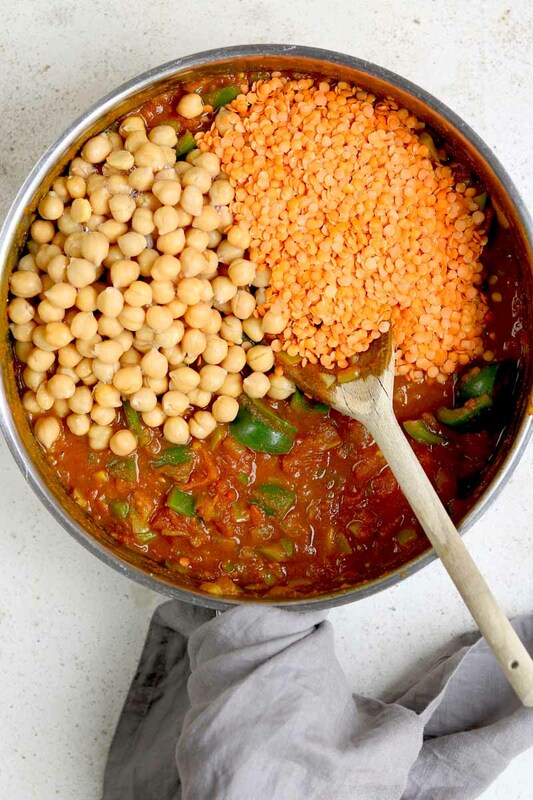 This chickpea and lentil curry is all of those things and more! It’s vegan, gluten-free and only takes 30 minutes to make. So, perfect for a weeknight dinner or great for a weekend when you want to ditch the takeaway. This curry is packed with goodness, chickpeas, red lentils, spinach and peppers! And because of all the protein, this curry is super satisfying and filling. Warmly spiced with a little kick of heat this is packed with flavour. You’ve probably heard me say this already but curries are a weekly occurrence in my house. Everyone in my family loves them, and since we went veggie they have become even more popular. 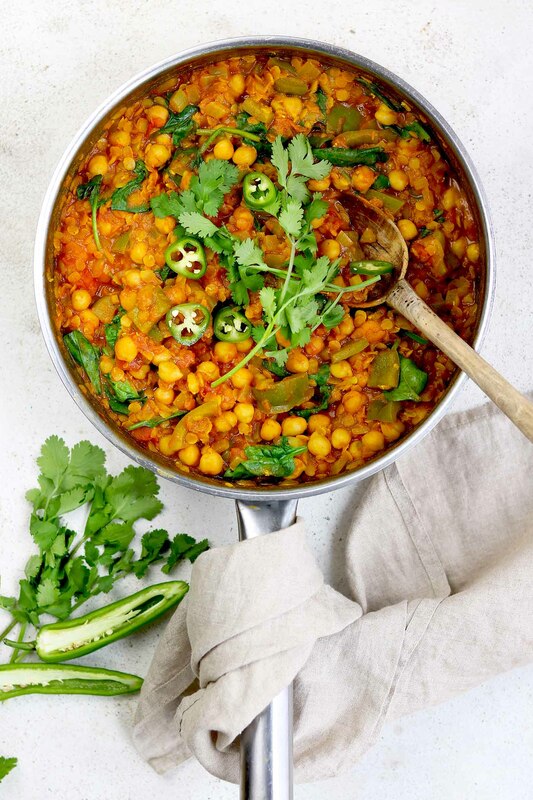 This chickpea and lentil curry is one of my favourites, not just because it tastes great but also because it’s ready in no time and all I need are store cupboard ingredients! Fry: Cook up the onion until it’s translucent, add the garlic, ginger and chilli. Then add in the spices, only cook those spices for a minute, any longer and they will burn. Burnt spices will kill your curry! Veggies: I use green bell pepper in this curry and finish it off with spinach. Liquid: You need some liquid to cook up those lentils and veggies. Tinned chopped tomatoes and vegetable stock are added to the curry. Make sure your vegetable stock is vegan if you want to keep this a vegan dish. Legumes: Legumes make this curry, those little seeds of superfood power, we love them! I use chickpeas and red lentils for this curry, ready cooked lentils work well too if you don’t have red lentils. Simmer: Once everything is in the pan, except for the spinach, then cover that pan with a tight-fitting lid and simmer for 15- 20 minutes. Once it is nice and thick and the lentils are cooked remove the lid then stir in the spinach and you are done! We like basmati rice and some naan with this however brown rice or quinoa is great too. If you fancy making this into a bit of a feast you could also serve some popadom with raita, lime pickle and chutney. Can I Freeze this Curry? Yes! You can freeze this, I would freeze this before I add the spinach. It will keep for up to a month in a labelled freezer friendly container. You could divide this up into portion sizes too if you like. Defrost overnight in the fridge, then reheat in a large pan once it is piping hot stir in the spinach. Veggies: Add more veggies, you could squeeze more veggies in here, another bell pepper, potatoes are great in this or maybe some mushrooms! Spice it up: Want it hotter? Add more chilli pepper or add in half a teaspoon of chilli powder. This curry does have a kick but hey there’s always room for more heat! Switch it up: You could switch the red lentils for precooked puy lentils, add some coconut cream to make it creamier. A rich and vibrant chickpea and lentil vegan curry. Ready in under 30 minutes this is perfect for a tasty weeknight dinner. Heat the oil in a large sauté pan. Add the onion and cook for about 10 minutes, until the onion is translucent. Add the garlic, chilli pepper and ginger, stir well and cook for a minute. Now add the bell pepper, and stir. Pour in the chopped tomatoes, stock, lemon juice, add the chickpeas and lentils. Add the salt and pepper then stir well. Bring the pan to the boil, reduce the heat to a gentle simmer then cover the pan with a tight-fitting lid. Cook for about 15 minutes stirring occasionally. Check the seasoning halfway through cooking. Once the lentils are cooked and the sauce has thickened add the spinach to the pan, put the lid back on for about two minutes. Take the lid off then stir in the wilted spinach. Serve immediately with rice, naan, some coriander (cilantro) leaves. Calories are approximate and do not include rice or naan. Nutritional information is also approximate. To keep this dish vegan please check the stock you use, not all stock is vegan. If you are serving this to younger children you may want to reduce the heat slightly, I would omit the chilli pepper completely for young kids. This dish is naturally gluten-free, again please check the stock to make sure it is gluten-free. If you want to batch cook this then there is a slider tool in the recipe card where you can increase the number of servings. This curry is really great for batch cooking. I am always looking for great Vegan recipes for my friend Melissa, she decided to make a lifestyle change last year and is always looking for delicious recipes. I’m so glad I found this one it looks amazing. Best option for my vegetarian friends. Looks spicy and delicious. I love how flavorful this is!! Yummy!! I made this for dinner last night and it was a total hit! Thanks so much for sharing! I’ve always loved lentils because they’re so quick cooking (no need to soak), but I’ve never tried them in curry before. This sounds off the charts good!